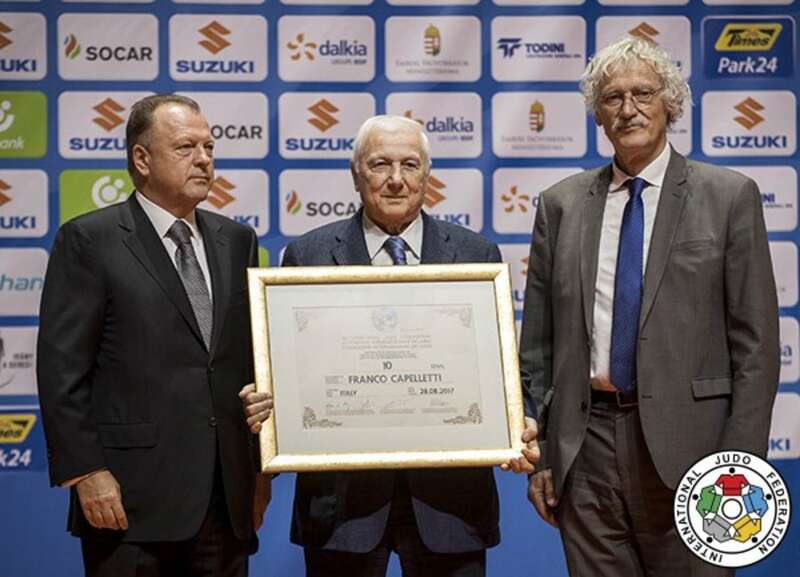 The 2017 Suzuki World Judo Championships saw Japan unleash their Tokyo 2020 generation to the world while Rio 2016 Olympic champions missed the medal podium and Italy’s IJF Hall of Famer Franco CAPELLETTI was awarded the coveted and exclusive 10th Dan Award. Day two of the IJF’s showpiece event belonged to the Land of the Rising Sun as the sport’s founding nations matched their exploits from day one with a flawless showing. After TAKATO Naohisa and TONAKI Funa (JPN) clinched the -60kg and -48kg world titles respectively, Japan were in command again with an irresistible display which was praised by Japan national team head coach INOUE Kosei. INOUE said: “We have made a good start and of course I am pleased. Our goal is for every player to win gold, this is our only aim. ABE is still only 20 years old and yet has great control on his mind and body and showed that he is ready for this level. Before the medal contests, the world witnessed a special 10th Dan presentation to IJF Hall of Famer Mr. Franco CAPELLETTI by IJF President Mr. Marius VIZER and IJF General Secretary Mr. Jean-Luc ROUGÉ. On a day where both categories saw rematches of the respective Olympic finals from Rio 2016, the competition heated up in sun-soaked Budapest on Tuesday. Japan are only the nation to win gold with four triumphs from four and the other 125 nations competing in Hungary have an uphill task to break their resistance with two top contenders to come on day three. Olympic champions Majlinda KELMENDI (KOS) and Fabio BASILE (ITA) missed out on the medal podium as the pressure and expectations for once took its toll on two of the stars of Rio 2016. On Wednesday, the attention of the sporting world will turn to the middleweights with the women’s -57kg and men’s -73kg categories set to be contested in Budapest on the biggest annual stage in the sport. Olympic champion Rafaela SILVA (BRA) and world number one HASHIMOTO Soichi (JPN) will both be chasing world glory. Worlds debutant SHISHIME Ai (JPN) won the 2017 Suzuki World Judo Championships on Tuesday with wins over a former Olympic champion, an Olympic bronze medallist and the reigning Olympic champion. The 23-year-old rose to the occasion to defeat teammate TSUNODA Natsumi. 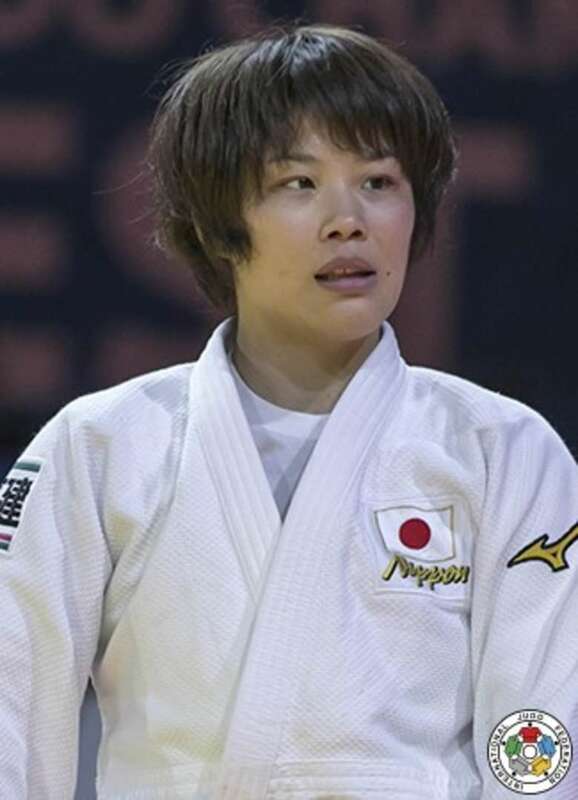 SHISHIME, who lost their previous meeting in December, was the best performer in the category as she defeated Tokyo Grand Slam winner TSUNODA, 25, by ippon with a uchi-mata. Six-time Grand Slam medallist SHISHIME is now in line to be the long-term replacement for three-time world champion and Olympic bronze medallist NAKAMURA Misato (JPN) who has not competed since the Olympics. In the first semi-final Rio 2016 Olympic champion Majlinda KELMENDI (KOS) was beaten for the first time since 2015 as SHISHIME proved to the world that anyone can be beaten in judo. In the sixth minute of golden score, KELMENDI made a mistake as the Japanese won by waza-ari from a uchi-mata-sukashi. SHISHIME kept busy with her probing ashi-waza which gave her a platform to test KELMENDI and Kosovo’s Rio 2016 flagbearer saw her opponent leave as the winner for the first time in 29 contests. 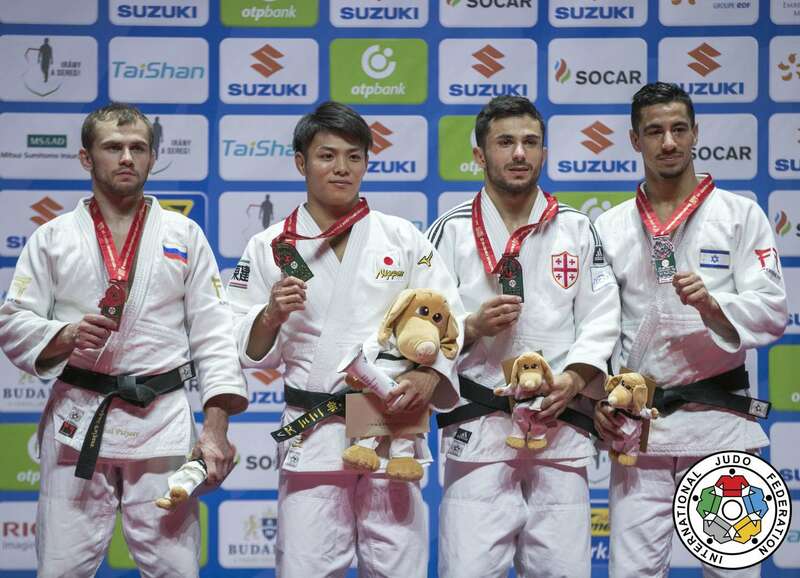 In the second semi-final TSUNODA defeated former Baku Grand Slam winner Gili COHEN (ISR) by two waza-ari scores. The second score, from an otsoto-otoshi, was the best action of the contest and the 25-year-old – who won one of the most prized titles in the sport, Tokyo Grand Slam gold, on her IJF debut – guaranteed a career-best result. The first bronze medal was won by Olympic bronze medallist Natalia KUZIUTINA (RUS) who held down COHEN with a tate-shiho-gatame for 20 seconds and ippon. The Russian, who won her Olympic bronze medal with the same finish in Rio, powered past her Israeli opponent with a controlled performance to win her third World Championships bronze and open her country’s medal account in Budapest. 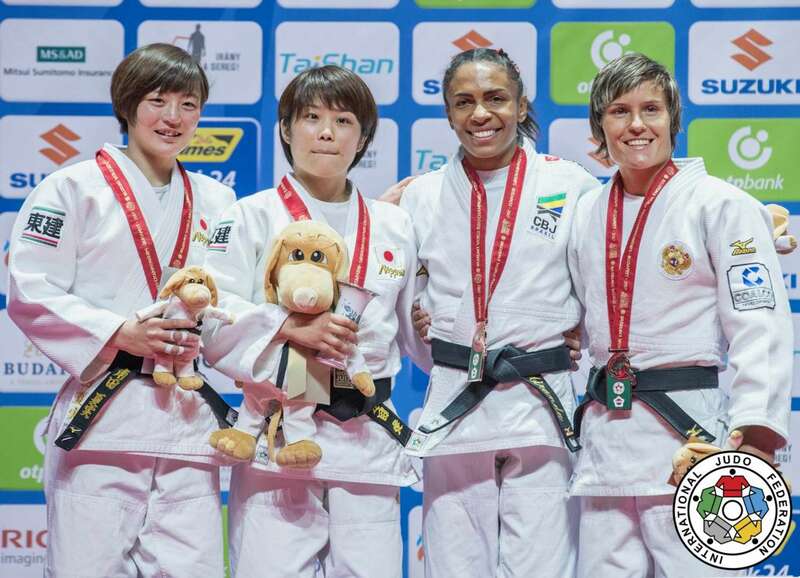 The second bronze medal was clinched by Worlds specialist Erika MIRANDA (BRA) who inflicted a surprise second successive defeat for KELMENDI. A waza-ari from the Brazilian was the only score of the contest as KELMENDI appeared to still be coming to terms with her semi-final defeat and MIRANDA grasped the opportunity to beat one of her greatest rivals on the IJF’s greatest stage. Judo Sogipa team member MIRANDA earned her fourth medal at this event, with gold still proving elusive, but Brazil will be buoyed by winning their first medal at Hungary’s first World Judo Championships. Japanese prodigy ABE Hifumi (JPN) has long been touted as a youngster destined for greatness. Where there are high expectations in Japan there is also caution and patience. ABE, 20, had to sit out the Rio 2016 Olympics as triple world champion EBINUMA – who went to win bronze for a second time - was preferred. The Nanjing 2014 Youth Olympic Games winner, who is the youngest Grand Slam winner in history having won at home in Tokyo aged 17 in 2014, savoured his Worlds showcase with a sensational victory over Mikhail PULIAEV (RUS) who now has three world silver medals. ABE, whose face features on advertising at the Tokyo Skytree, the television broadcasting tower and famed landmark, is the leader of Japan’s Tokyo 2020 generation, and, while he is understated off the mat, he is a must-see performer and saved his best until last as he defeated his 30-year-old Russian rival by ippon with a sumptuous sode-tsurikomi-goshi. Japan’s starlet won five of his six contests by ippon and scored six waza-ari on his way to gold. 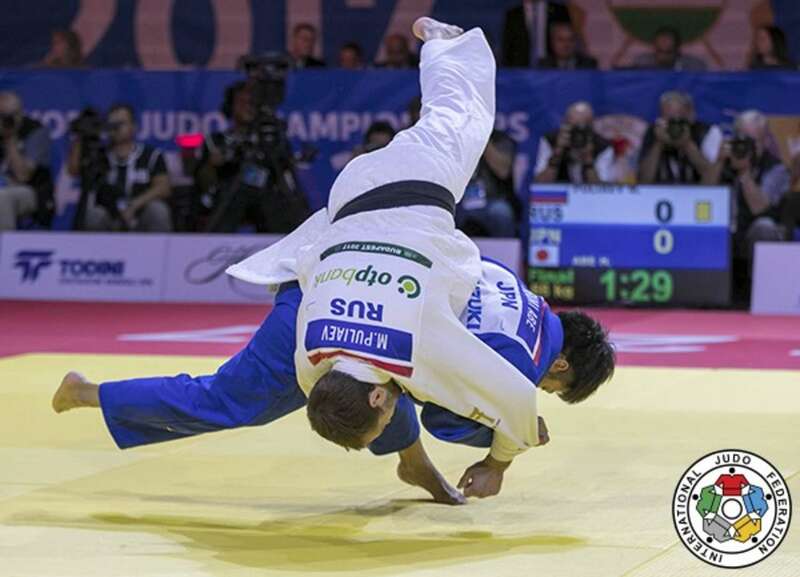 In the first semi-final top seed Tal FLICKER (ISR) was beaten by PULIAEV in golden score by a waza-ari from a morote-seoi-nage as both remained in medal contention. In the second semi-final ABE pinned down two-time Grand Prix winner Vazha MARGVELASHVILI (GEO) for 20 seconds after taking the lead with a waza-ari from a ko-soto-gake. In the first bronze medal contest Worlds newcomer MARGVELASHVILI defeated Samsun Grand Prix winner KIM Limhwan (KOR) as South Korea missed out on the medal podium. The Georgian held down KIM for 20 seconds to provide the first medal for his country who are expected to feature heavily later in the week as the competition moves into the heavier weight categories. The second bronze medal was won by FLICKER who bested 2009 world champion Georgii ZANTARAIA (UKR). The world number one position for FLICKER may have played on his mind as he entered the competition with the top billing for the first time but the Israeli judoka showed his character by recovering from a semi-final defeat to achieve his finest result. After 29 seconds of golden score, ZANTARAIA was made to pay for a momentary lack of concentration as FLICKER flourished in added time with a osoto-gari that left the Ukranian flat on his back and sent the former onto his first Worlds medal podium.